PORTALES, N.M. — Junior right fielder Kelsey Kubik (Tucson, AZ/Pima College) and senior shortstop Jessica Nocas (Riverside, CA/Midland College) both finished the 2006 season batting over .400 and have been named First Team All-Lone Star Conference South Division, as selected by the LSC South head coaches. Kubik hit .439 to lead the Zias, while Nocas batted .413. The First Team All-LSC South squad featured 13 players from the seven LSC South teams. Three Zias received Second Team All-LSC South honors. Eastern’s Second Team selections were Kristina Goodman (Jr., CF, Artesia, NM/Vernon College), Tracy Jordan (Sr., 2B, Rosamond, CA/Desert HS) and Rosemary Moreno (Sr., P, Midland, TX/Midland College). Honorable Mention recognition went to ENMU players Christina Helland (So., LF, Albuquerque, NM/Rio Rancho HS), Elizabeth Whipkey (So., 1B, Orange, CA/Villa Park HS) and Tina Whitt (Sr., C/3B, Riverside, CA/Midland College). A total of athletes were named to the Second Team, with 18 players receiving Honorable Mention. ENMU improved its record by 13 wins this season compared to 2005, finishing the year with a 33-21 record and only one game out of the LSC Tournament with a 13-11 conference mark. A year ago, ENMU was 20-29 overall and 3-17 in the LSC South. Head Coach Armando Quiroz took the helm of the Zias this season and managed a team that finished first in eight offensive categories in the LSC. Amber Daniel, who filled in last season as the acting head coach when Quiroz suffered a broken leg and severely sprained ankle, returned to her duties as the graduate assistant coach this year. In her first year at ENMU this season, Kubik led the Zias with a .439 batting average, which place her second on the LSC statistical chart. Her .491 on-base percentage led the conference and she ranked second in the LSC with 50 RBIs. Kubik was the LSC South Hitter of the Week on March 28, as she led the Zias to a series sweep over West Texas A&M with an impressive .846 batting average (11 of 13), to go with 15 RBIs in four games. Kubik also belted eight home runs during the season and earned a .684 slugging percentage to rank fourth in the conference. She tied for fifth in the LSC with 68 hits, while providing a .927 fielding percentage in right field. She played in 49 game, including 47 starts. Nocas, who started all 54 games for the Zias, had a spectacular senior season, recording a .413 batting average. She was chosen the LSC South Hitter of the Week on Valentine’s Day, after posting a .552 batting average in seven games, with two or more RBIs in five of the games. Her 51 runs and 78 hits during the season tied her with Goodman for second highest in the LSC in both categories. She hit 11 home runs to rank third in the LSC, behind ENMU record-holder Tina Whitt (13) and Nicole Deel of Abilene Christian University (13). 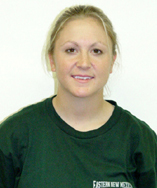 Nocas was chosen Honorable Mention All-LSC South in 2005. 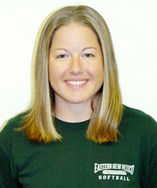 During two seasons at ENMU, Nocas achieved a .403 career batting average to rank second on Eastern’s all-time list. She played and started 101 games for the Zias, while scoring 82 runs, earning 92 RBIs, hitting 24 doubles and belting 15 home runs. Goodman had an outstanding first year with the Zias, after transferring from Vernon College. She finished second in the LSC in four offensive categories, with 51 runs, 78 hits, 220 plate appearances and 203 at bats. She tied Nocas for team highs in hits and runs, while earning a solid .384 batting average. Goodman started all 54 games for the Zias. Jordan, the only player on the ENMU team in her fourth season with the Zias, recorded career highs with a .394 batting average on offense and a .959 fielding percentage on defense. She provided Eastern with 41 runs, 43 RBIs and 15 doubles. Her .455 on-base percentage ranked second on the team. She also recorded a .618 slugging percentage. She started at second base in all 54 games, finishing with 109 assists, fifth highest in the LSC. She capped off her Zia career with three home runs against Angelo State in the season’s final four-game series. Jordan tied for second on Eastern’s career list with 200 games played and tied for fourth with 193 starts. She also contributed 102 RBIs (4th), 38 doubles (3rd), 21 sacrifice bunts (1st tie), 77 runs and 36 walks during her career. 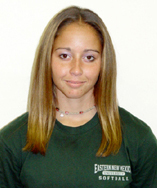 On defense, she provided 388 putouts, plus an ENMU record 365 assists. 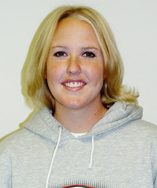 She was named Honorable Mention All-LSC South in 2004. Moreno pitched herself into the Zia record book in 2006 by winning the second-most games in a season with a 19-9 record, as she trailed only Jennifer Harrer (24-8 in 2001). She started in half of the Zias’ 54 games to rank third in the LSC in starts. She finished the season with a 3.32 ERA. She was 10-4 with a 2.78 ERA in the LSC South, with at least one win over each of the other South Division teams. 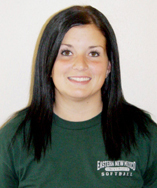 Her seven shutout victories moved her into second on Eastern’s single season list. She also ranked second at Eastern with 191 2/3 innings pitched, 131 strikeouts, 23 complete games and 35 appearances this season. Moreno was 5-5 after 10 decisions, but won 11 consecutive games on her way to a 14-4 finish. She ranked third in the LSC in innings pitched and starts (27). Helland provided a solid performance in 2006, after being named Second Team All-LSC South as a freshman. She achieved a .298 batting average this season, with seven homers, 30 RBIs, 38 runs and 14 doubles. She tied Nocas for third in the LSC with 213 total plate appearances. Her career statistics include 88 games played, 85 starts, 99 hits, 63 runs and 41 RBIs. 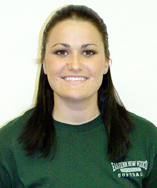 Helland has achieved a .331 career batting average so far at ENMU. Whipkey was selected Honorable Mention All-LSC South for the second consecutive season. She produced a .343 batting average and a nearly-perfect .995 fielding percentage at first base. She was second in the LSC in putouts (362) and total chances (378). She attained the fourth-most walks in the conference (28), while providing 41 runs, 34 RBIs and 58 hits for the Zias. 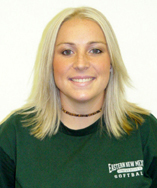 In two seasons at Eastern, Whipkey has achieved a .367 batting average. She has played in 99 games, with 96 starts. She has earned 113 hits, 60 runs, 72 RBIs and 21 doubles. Defensively, she has earned 636 putouts, 33 assists and just 7 errors for a .990 career fielding percentage. Whitt completed her two-year career for the Zias by breaking the school record with 13 home runs this spring, as she tied for first place in the LSC. She was chosen LSC South Hitter of the Week on March 1, after batting .667 (10 of 15), including four homers, in a four-game split with Western New Mexico University. Whitt batted .367 during the season and ended the year first in the LSC with 17 doubles and five sacrifice flies. She was fifth in the conference with 48 RBIs. She also played well behind the plate, with 149 putouts and 41 assists. 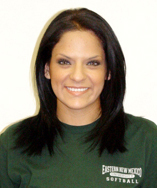 During her career, Whitt ranked fifth at ENMU with a .367 overall batting average. She also earned 111 hits, 59 runs, 22 doubles, 15 homers and 74 RBIs, while playing in 92 games (90 starts). The LSC South head coaches also voted for several special awards. The awards and recipients were: Coach of the Year, Chantiel Wilson, Abilene Christian; Player of the Year, Kassie Rezza (Sr., 2B), Texas A&M University-Kingsville; Pitcher of the Year, Jennifer Leal (Sr., RHP), Abilene Christian; Co-Freshmen of the Year, Macy Baker (SS), Angelo State and Tiffanie Boone (OF), Texas Woman’s University; Newcomer of the Year, Kandace Kubat (Jr., OF), Angelo State.